I was recently contacted by Love Crochet and asked if I'd like to receive some yarn in exchange for sharing a craft tutorial on my blog. Of course I said yes, I find it very difficult to turn down craft supplies! 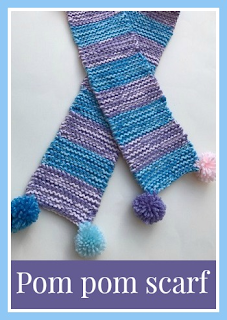 So here's how I used the yarn to make a little knitted scarf for Mia, complete with pom poms on each end. I was sent four 100g balls of Painbox Yarns in pastel colours. The four colours are 146 Dusty Lilac, 152 Ballet Pink, 138 Sky Blue and 131 Seafoam Blue. They all co-ordinate beautifully together. To make the scarf I decided to use two strands of yarn at a time and I knitted with 5 mm needles (UK size 6). I cast on with 16 stitches which made a scarf with a width of about 10cm. It makes quite a narrow scarf, but Mia is only little so it fits her perfectly! The scarf is knitted entirely in garter stitch, knitting every row. Each stripe is 12 rows which makes them about 4 cm wide. The entire scarf measures about 115 cm - I read that the length of a scarf should be the same as the height of the person that it is intended for and that seemed pretty accurate. I made sure to try it out on Mia before I cast off! Then I used the yarn to make a coloured pom pom for each corner of the scarf. I used a pom pom maker which was brilliant, it made the pom poms really quickly and easily, quite a revelation after I've always faffed about with cardboard rings! Make sure to leave long tails on the pom poms when you tie them off so that they can be sewn firmly to the ends of the scarf. I suspect that they are going to be fiddled with! I'm really pleased with this scarf and Mia is too! I received the yarn for this project and a pom pom maker set in exchange for a review.